The National Invitation Tournament (NIT) is a men's college basketball tournament operated by the National Collegiate Athletic Association (NCAA). Played at regional sites and at Madison Square Garden (Final Four) in New York City each March and April, it was founded in 1938 and was originally the most prestigious post-season showcase for college basketball. Over time it became eclipsed by the NCAA Division I Men's Basketball Tournament – known today informally as "March Madness". The NIT has since been regarded more as a "consolation" tournament for teams that did not receive a berth in the NCAA tournament. A second, much more recent "NIT" tournament is played in November and known as the NIT Season Tip-Off. Formerly the "Preseason NIT", it was founded in 1985. Like the postseason NIT, its final rounds are played at Madison Square Garden. Both tournaments were operated by the Metropolitan Intercollegiate Basketball Association (MIBA) until 2005, when they were purchased by the NCAA, and the MIBA disbanded. Unless otherwise qualified, the terms "NIT" or "National Invitation Tournament" refer to the post-season tournament in both common and official use. The post-season National Invitation Tournament was founded in 1938 by the Metropolitan Basketball Writers Association, one year after the NAIA Tournament was created by basketball's inventor Dr. James Naismith, and one year before the NCAA Tournament. The first NIT was won by the Temple University Owls over the Colorado Buffaloes. Responsibility for the NIT's administration was transferred in 1940 to the Metropolitan Intercollegiate Basketball Committee, a body of local New York colleges: Fordham University, Manhattan College, New York University, St. John's University, and Wagner College. This became the Metropolitan Intercollegiate Basketball Association (MIBA) in 1948. Originally the tournament invited a field of 6 teams, with all games played at Madison Square Garden in downtown Manhattan. The field was expanded to 8 teams in 1941, 12 in 1949, 14 in 1965, 16 in 1968, 24 in 1979, 32 in 1980, and 40 from 2002 through 2006. In 2007, the tournament reverted to the current 32-team format. There was limited national media coverage of college basketball in the 1930s and '40s, and playing in New York City provided teams greater media exposure, both with the general public and among high school prospects in its rich recruiting territory. The NCAA tournament selection committee invited only one team each from eight national regions, potentially leaving better quality selections and natural rivals out of its field, which would opt for the NIT. In the 1940's, when the NCAA tournament was less than 10 years old, the National Invitation Tournament, a saturnalia held in New York at Madison Square Garden by the Metropolitan Intercollegiate Basketball Association, was the most glamorous of the post-season tournaments and generally had the better teams. The winner of the National Invitation Tournament was regarded as more of a national champion than the actual, titular, national champion, or winner of the NCAA tournament. Several teams played in both the NIT and NCAA tournaments in the same year, beginning with Colorado and Duquesne in 1940. Colorado won the NIT in 1940 but subsequently finished fourth in the NCAA West Region. In 1944, Utah lost its first game in the NIT but then proceeded to win not only the NCAA tournament, but also the subsequent Red Cross War Charities benefit game in which they defeated NIT champion St. John's at Madison Square Garden. In 1949, some Kentucky players were bribed by gamblers to lose their first round game in the NIT. This same Kentucky team went on to win the NCAA. In 1950, City College of New York won both the NIT and the NCAA tournaments in the same season, coincidentally defeating Bradley University in the championship game of both tournaments, and remains the only school to accomplish that feat because of an NCAA committee change in the early 1950s prohibiting a team from competing in both tournaments. The champions of both the NCAA and NIT tournaments played each other for a few years during World War II. From 1943 to 1945, the American Red Cross sponsored a postseason charity game between each year's tournament champions to raise money for the war effort. The series was described by Ray Meyer as not just benefit games, but as "really the games for the national championship". The NCAA champion prevailed in all three games. The Helms Athletic Foundation retroactively selected the NIT champion as its national champion for 1938 (Temple), and chose the NIT champion over the NCAA champion once, in 1939 (Long Island). More recently, the mathematically based Premo-Porretta Power Poll published in the ESPN College Basketball Encyclopedia retroactively ranked teams for each season prior to 1949, with the NIT champion finishing ahead of the NCAA champion in 1939 and 1941. Premo-Porretta ranks four NCAA champions as the best for each season, the rest being non-championship winning teams. Between 1939 and 1970, when teams could compete in either tournament, only DePaul (1945), Utah (1947),, San Francisco (1949) and Holy Cross (1954)  claim or celebrate national championships for their teams based solely on an NIT championship, although Long Island recognizes its selection as the 1939 national champion by the Helms Athletic Foundation, made in 1943. In 1943 the NCAA tournament moved to share Madison Square Garden with the NIT in an effort to increase the credibility of the NCAA Tournament. In 1945, The New York Times indicated that many teams could get bids to enter either tournament, which was not uncommon in that day. In any case, since the mid-1950s, the NCAA tournament has been popularly regarded by most institutions as the pre-eminent post season tournament, with conference champions and the majority of the top-ranked teams participating in it. Nevertheless, as late as 1970, Coach Al McGuire of Marquette, the 8th-ranked team in the final AP poll of the season, spurned an NCAA at-large invitation because the Warriors were going to be placed in the NCAA Midwest Regional (Fort Worth, Texas) instead of closer to home in the Mideast Regional (Dayton, Ohio). The team played in the NIT instead, which it won. This led the NCAA to decree in 1971 that any school to which it offered a bid must accept it or be prohibited from participating in postseason competition, reducing the pool of teams that could accept an NIT invitation. As the NCAA tournament expanded its field to include more teams, the reputation of the NIT suffered. In 1973, NBC moved televised coverage of the NCAA championship from Saturday afternoon to Monday evening, providing the NCAA Tournament with prime-time television exposure the NIT could not match. Even more crucially, when the NCAA eliminated the one-team-per-conference rule in 1975, its requirement that teams accept its bids relegated the NIT to a collection of teams that did not make the NCAA grade. Compounding this, to cut costs, the NIT moved its early rounds out of Madison Square Garden in 1977, playing games at home sites until the later rounds. This further harmed the NIT's prestige, both regionalizing interest in it and marginalizing it by reducing its association with Madison Square Garden. By the mid-1980s, its transition to a secondary tournament for lesser teams was complete. In 2005, the NCAA purchased 10-year rights to the NIT from the MIBA for $56.5 million to settle an antitrust lawsuit, which had gone to trial and was being argued until very shortly before the settlement was announced. The MIBA alleged that compelling teams to accept invitations to the NCAA tournament even if they preferred to play in the NIT was an illegal use of the NCAA's powers. In addition, it argued that the NCAA's expansion of its tournament to 65 teams (68 since 2011) was designed specifically to bankrupt the NIT. Faced with the very real possibility of being found in violation of federal antitrust law for the third time in its history, the NCAA chose to settle. (The first two violations were related to restrictions on televising college football and capping assistant coach salaries.) As part of the purchase of the NIT by the NCAA, the MIBA disbanded. Because the post-season NIT consists of teams that failed to receive a berth in the NCAA Tournament, the NIT has been nicknamed the "Not Invited Tournament", "Not Important Tournament", "Never Important Tournament", "Nobody's Interested Tournament", "Needs Improvement Tournament", "No Important Team", "National Insignificant Tournament," or simply "Not In Tournament". It has also been called a tournament to see who the "69th best team" in the country is (since there are now 68 teams in the NCAA Tournament). David Thompson, an All-American player from North Carolina State, called the NIT "a loser's tournament" in 1975. NC State, which had been the previous year's NCAA champion, refused to play in the tournament that year, following the precedent set by ACC rival Maryland the previous season after losing the Atlantic Coast Conference championship game to the top-ranked Wolfpack. In succeeding years, other teams such as Oklahoma State, Louisville, Georgia Tech, Georgetown, and LSU have declined to play in the NIT when they did not make the NCAA tournament. One such team was Maryland; after being rejected by the NCAA selection committee in 2006, head coach Gary Williams announced that 19-11 Maryland would not go to the NIT, only to be told that the university had previously agreed to use Comcast Center as a venue for the NIT. The Terrapins were eliminated in the first round by the Manhattan College Jaspers. In 2008, however, Williams announced that if invited, the Terps would play, because it would serve as a chance to further develop six freshman players on his squad and to give senior forward James Gist more exposure. At UCLA's Pauley Pavilion, there are individual championship banners for all 11 NCAA titles, various other banners touting many other NCAA and other tournament championships for other sports, but no mention of UCLA's 1985 NIT championship. However, during the recent remodeling of Pauley Pavilion a plaque was installed along the concourse of the building commemorating the Bruins 1985 NIT Championship. The NIT Season Tip-Off carries none of the postseason tournament's stigma, and is one of many popular season-opening tournaments held every year around the country (alongside events such as the Maui Invitational and the now-defunct Great Alaska Shootout). In the past, NIT teams were selected in consultation with ESPN, the television home of the NIT. The goal of the NIT was to sustain the MIBA financially. Therefore, schools selected to play in the NIT were often major conference teams with records near .500 that had large television fan bases and would likely have a respectable attendance for tournament games on their home court. The latter is one reason why New Mexico was invited virtually every year — the Lobos often had a winning season but failed to qualify for the NCAA tournament. Seeding considerations and home court advantage included the number of fans willing to show up to each game. In an effort to maintain some quality, a rule saying that a team must have a .500 or better record[clarification needed] to qualify for the NIT was imposed. Teams are no longer required to have .500 or greater records[clarification needed] to receive bids. Similar to the automatic bids the NCAA Tournament grants for all conference tournament champions, all teams that won regular-season conference championships but failed to earn NCAA tournament bids are guaranteed places in the NIT. In addition, the selection process was changed. ESPN no longer had a hand in the selection of the teams. Instead, a committee of former NCAA head coaches, chaired by Newton, and including Gene Keady (Purdue), Don DeVoe (Tennessee), Rudy Davalos, Les Robinson (NC State), Reggie Minton (Air Force), John Powers, and Carroll Williams among others, prepared a list of potential teams in advance. Beginning with the 2016 NIT, the committee makeup was restructured; committee members will serve a maximum four-year term, and the committee will feature a mix of current athletics administrators who are actively working at NCAA schools or conferences and former head college basketball coaches. Previously, the NIT Committee had eight members, all of whom had been former head college basketball coaches or athletics directors. The previous structure had no term limits or succession plan. ESPN continues to provide television coverage of the tournament. In 2011 the NCAA and ESPN agreed to a $500 million agreement through 2023–24 for rights to cover championships in several sports, including the NIT; this compares with the 11-year, $6.2 billion TV contract with CBS for the NCAA tournament. These changes are intended to encourage participation by good college teams that would rather stay home than play in the NIT – to make it the "Little Dance" instead of the "loser's tournament". Former NIT Committee chair and former Alabama and Vanderbilt head coach C. M. Newton stated, "What we want to have is a true basketball event, a real tournament, one where there's no preconceived ideas of who gets to New York. We'd love to have great crowds, but this is not a financial consideration. We want good television coverage, but we're not going to play this thing for television and move games around". Another consideration is that a number one-seeded team that goes to the semifinals will have three home games, which helps ticket sales. Since the 2007 tournament, the 32-team field used from 1980 through 2001 is the same, eliminating the eight-game "play-in" opening round where teams played to qualify for second round games against the top eight seeds used 2002–2006. The tournament features four eight-team regions. The format won't affect the NIT's automatic bid to any regular-season conference champion that do not make the NCAA's field of 68, since 2011. Seven teams earned an NIT bid that way in 2006. A new attendance record for an NIT game was set at Syracuse University's Carrier Dome on March 19, 2007, at the Syracuse-San Diego State game. Syracuse won the game 80–64 with an attendance total of 26,752. The previous record of 23,522 was set by Kentucky in 1979. From 1969 to 1996, a National Women's Invitational Tournament (NWIT) existed; the tournament was resurrected under the same name in 1998, and has been known as the Women's National Invitation Tournament (WNIT) since 1999. The original NWIT was an eight-team tournament held in Amarillo, Texas throughout its history. The revived tournament began with 16 teams, expanded to 32 in its second season, and has since expanded further to 40, 48, and (since 2010) 64 teams. However, the WNIT is affiliated with the NIT in name only. Neither the NWIT nor WNIT was connected with MIBA, and the WNIT was not purchased by the NCAA. ^ St. John's won the 2003 NIT title, but later vacated the title due to an ineligible player. ^ Marcus Hatten of St. John's was the MVP of the 2003 tournament, but vacated the award with St. John's title. ^ Minnesota won the 1998 NIT title, but later vacated the title due to academic fraud. ^ Kevin Clark of Minnesota was the MVP of the 1998 tournament, but vacated the award with Minnesota's title. ^ Michigan won the 1997 NIT title, but later vacated the title and forfeited its entire 1996-97 schedule due to ineligible players. ^ Robert Traylor of Michigan was the MVP of the 1997 tournament, but was later declared ineligible and his award vacated. ^ a b Pascoe, Bruce (March 14, 2010). "Cats hold breath: Is it NIT or not?". Arizona Daily Star. p. C1. ^ "NCAA buys tournaments, ends NIT litigation". ESPN.com. ^ "USATODAY.com - NIT's postseason field cut to 32 teams". ^ "NIT Tournament Home". NCAA.com. ^ "NCAA Selection Group Named". The Spokesman-Review. Spokane, WA. Associated Press. February 24, 1949. Retrieved 2013-03-13. ^ Fraley, Oscar (March 5, 1951). "Scandal Brings More Prestige to NCAA". The Times-News. Hendersonville, NC. Retrieved 2013-03-21. ^ Harrison, Don (2011). Hoops in Connecticut: The Nutmeg State's Passion for Basketball. The History Press, Charleston, SC. p. 54. ISBN 1609490835. "[John] Egan was the Providence College Friars' first "name" recruit, the player who arrived with the most acclaim. And he delivered as a sophomore [in 1959], averaging a team-high 20.9 points en route to propelling the Friars to a fourth-place finish in the then-prestigious National Invitation Tournament at Madison Square Garden." ^ Hurley, Bob (2013). Chasing Perfect: The Will to Win in Basketball and Life. Crown Archetype, New York, NY. p. 26. ISBN 030798687X. "That  St. Peter's team was the best team the school ever had. That team would go on to beat Duke in the National Invitation Tournament, back when the NIT was a big-time tournament." ^ Miller, Ralph (1990). "Ralph Miller: Spanning the Game." Sagamore Publishing LLC. p. 56. ISBN 0915611384. "Had the Aggies lost one, we would have been forced to have a playoff, and that was the problem. We had already accepted a bid to play in the  National Invitation Tournament (NIT). The tournament picture was much different then. There was no announcement of NIT teams following the selection of the NCAA field as exists today. The reason was that the NIT was still considered a premier tournament." ^ Davies, Richard O. (2007). "Sports in American Life: A History." Wiley, John & Sons, Incorporated. p. 155. ISBN 9781405106474. "In 1938, [Ned] Irish invited 16 [sic] teams to compete in a new tournament that he called the National Invitation Tournament (Temple defeated Colorado 60-36 in the final), and it would be the premiere college basketball event for more than a decade. The following year, the NCAA responded by creating its own tournament, but it did not surpass the NIT as the premier postseason tournament until the 1950s." ^ Peeler, Timothy M. (2010). "NC State Basketball: 100 Years of Innovation." University of North Carolina Press, The. p. 66. ISBN 9780807899700. "Despite winning the crown, the Red Terrors did not have a chance to play in the 1947 NCAA Tournament. Before the league's event began, NC State's newly named athletic director Jon Von Glahn was offered the chance to play in the NCAA Tournament, contingent on [Everett] Case's team winning the league tournament. Instead he chose a spot in the more prestigious National Invitation Tournament. So the NCAA District 3 selection committee gave the area's bid to Carnevale's team from Navy." ^ Chansky, Art (2006). "Blue Blood: Duke-Carolina: Inside the Most Storied Rivalry in College Hoops" Macmillan. p. 113. ISBN 0312327889. "The NCAA Tournament field had fluctuated between 22 and 25 teams since 1953, during which time the National Invitation Tournament remained prominent and, in the Northeast, actually bigger. ... The ACC, however, had an unwritten rule stemming from the point-shaving scandals of the last two decades that it would not send teams to the NIT. [Coach Victor] Bubas requested that the policy be changed in 1967, and it was. Duke accepted the ACC's first ever bid to the NIT, ..."
^ Pannell, Blaine; Chilton, Kyle (2013). "Winning: A BYU Tradition". BYU Basketball Twenty Thirteen Twenty Fourteen Almanac (PDF). Brigham Young University. p. 54. Retrieved 2013-11-20. "BYU claim a national championship based on their 1951 NIT title." ^ a b McPhee, John (1999). A Sense of Where You Are: Bill Bradley at Princeton. Farrar, Straus and Giroux, New York, NY. pp. 114–115. ISBN 0374526893. ^ Green, Andrew R. (2012). 2012-13 Colorado Basketball Men's Basketball Information Guide and Record Book (PDF). University of Colorado Sports Information Office. p. 74. Retrieved 2013-04-07. ^ ESPN, ed. (2009). ESPN College Basketball Encyclopedia: The Complete History of the Men's Game. New York, NY: ESPN Books. p. 35. ISBN 978-0-345-51392-2. ^ "NCAA Tournament History". Retrieved 2010-04-12. ^ a b c Carlson, Chad (2012). "A Tale of Two Tournaments: The Red Cross Games and the Early NCAA-NIT Relationship". Journal of Intercollegiate Sport. 5: 270–271. Retrieved 2014-03-18. ^ "Rauzulu's Street: Helms Foundation NCAA Division I Champions". Retrieved 2009-03-05. ^ ESPN, ed. (2009). ESPN College Basketball Encyclopedia: The Complete History of the Men's Game. New York, NY: ESPN Books. pp. 549–586. ISBN 978-0-345-51392-2. ^ Greenwell, Greg (2012). 2012-13 DePaul Basketball. DePaul Athletics Communication Department. p. 99. Retrieved 2013-04-07. ^ Harris, Kyle (2012). 2012-13 Utah Basketball Media Guide (PDF). University of Utah Athletic Communications Office. p. 87. Retrieved 2013-04-07. ^ "National Championships". University of San Francisco. August 8, 2012. Archived from the original on April 2, 2013. Retrieved 2013-04-07. ^ Swan, Joe; Messerly, Bryan, eds. (2012). 2012-13 WVU Men's Basketball Guide. West Virginia University Department of Intercollegiate Athletics. Retrieved 2013-04-07. ^ Fratto, Mark (2010). 2010-11 St. John's Men's Basketball Media Guide (PDF). St. John's Athletic Communications. Retrieved 2013-04-07. ^ Caldwell, Janiece; Combs, Alex; Hayden, John; Moore, Deb (2012). 2012-13 Kentucky Basketball Fact Book (PDF). University of Kentucky Athletics Department. Retrieved 2013-04-07. ^ Saint Louis University Men's Basketball History & Records Book (PDF). Saint Louis University Athletics. 2013. Retrieved 2013-04-07. ^ Lobacz, Dan (2012). LIU Brooklyn Basketball 2012-13 Records Book (PDF). LIU Athletics Media Relations. p. 38. Retrieved 2013-04-07. ^ Scott, Jon (Nov 9, 2010). "The truth behind the Helms Committee". Retrieved 2015-12-14. 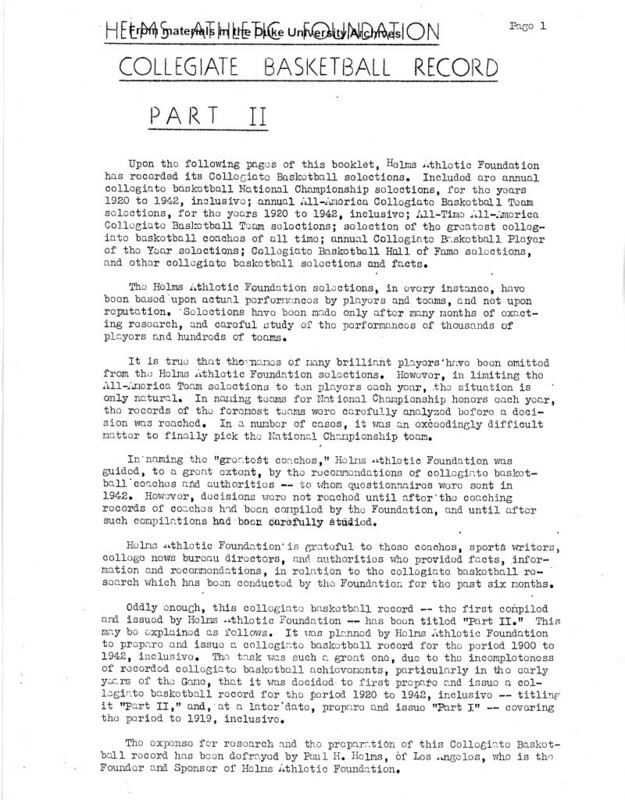 ^ "Helms Athletic Foundation Collegiate Basketball Record (preface)". Helms Athletic Foundation. Feb 1, 1943. Retrieved 2015-12-14. ^ "Tennessee Becomes Third Quintet to Enter National Invitational Tournament at Garden". The New York Times. March 4, 1945. Retrieved 2014-03-18. ^ Douchant, Mike (March 11, 2003). "MARCH MADNESS: Growth of NCAA Tournament. Final Four Hasn't Always Been What it is Today". The Official Website of the National Association of Basketball Coaches. Retrieved 2010-09-30. ^ a b c d John Feinstein (1 February 2016). "Kryzyzewski, Knight coached at Army. It still lacks an NCAA tournament appearance". Washington Post. ^ . "Cowboys in shocker", Denver Post, March 10, 2006. ^ Scott Polacek. "LSU Basketball Elects Not to Participate in Postseason". Bleacher Report. ^ "Basketball Elects Not to Participate in Postseason". LSUsports.net. ^ Prisbell, Eric. "Terps Can't Help Themselves", Washington Post, March 14, 2008, page E01. ^ Eric Bailey, "Long and happy history: Two NIT titles precede Tulsa's appearance", Tulsa World, March 18, 2009. ^ Don Amore, "Years ago, UConn, Jim Calhoun Sat On Top Of A Different World", Hartford Courant, March 28, 2013. ^ Butler, J. P. (March 16, 2015). No tournament for Bonnies. Olean Times Herald. Retrieved 2015-03-16. ^ Mark Alesia, Jack Carey (August 17, 2005). "Supporters of buyout expect improved NIT". USA Today. Retrieved 2014-04-07. ^ "Lobos put right foot in NIT with Utah win", Albuquerque Tribune, March 4, 2006. ^ "Supporters of buyout expect improved NIT", USA Today, August 17, 2005. ^ "College basketball: NIT announces committee restructure, new members". NCAA. Retrieved 2015-10-28. ^ "ESPN extends deal through 2023-24". NCAA.com. Retrieved 2013-03-15. ^ "March Madness Swells as NCAA Pumps Up NIT Tournament" Archived September 30, 2007, at the Wayback Machine, Bloomberg.com, March 14, 2006. ^ Peter Chen. "Stanford Exterminates Gophers to Win 2012 NIT, Can't Wait Till Next Year". Bleacher Report.